For the first time ever, the mechanical heart of the Girard-Perregaux Vintage 1945 XXL Large Date and Moon Phases is revealed in a titanium DLC case with a blue polycrystalline transparent dial. The swiss luxury watchmaking Manufacture, Girard-Perregaux based in la Chaux-de-Fonds unveils a unique piece in order to support the 6th edition of the biennial charity auction for the benefit of research into Duchenne muscular dystrophy. Authentic artistic icon, worthy successor of girard- Perregaux’s history, the girard-Perregaux Vintage 1945 XXL Large Date and Moon Phases only Watch reveals for the first time a case in titanium DLC and a transparent dial carved in blue polycrystalline, a hint to the color of the Foundation’s logo. its genesis; a contemporary style, perfect symmetry and a mechanical manufactured movement. In terms of technical specifications, all the indications of time are harmoniously arranged and readable at a glance. at 12 o’clock, the large jumping date displays the date on a pair of discs one of which is transparent in an exclusive patented system of the brand. the moon phase indicator at 6 o’clock provides a perfect visual balance while the hands and the applied arabic numerals indicates the hours in a sheer simplicity. the case-back side, open on the visible movement, features the emblematic signature of only Watch. 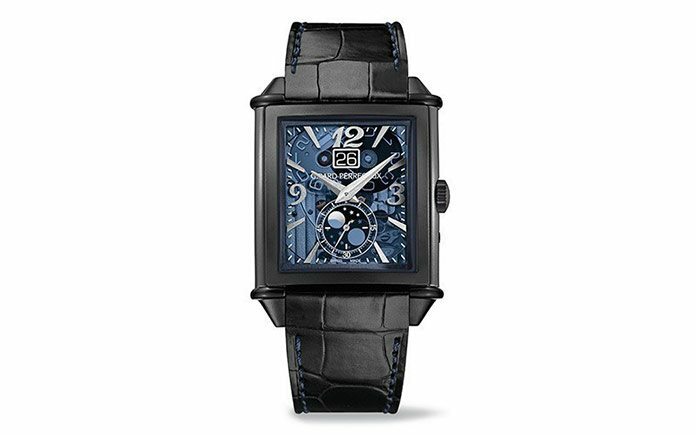 Designed in the purest art Deco style, the rectangular «1945» case – named for the year of its creation forms part of the repertoire of iconic girard-Perregaux classics, and the gP 03300-0105 manufactured caliber match its dimensions, which is highly unusual for watches with distinctive shapes. With 282 components, the frequency of the self-winding caliber is fixed at 28,800 vibrations per hour. Preciously decorated in line with the highest standards of fine watchmaking, the list of its high- end finishes is like an anthology of decorative traditions.